New to Mike Geier’s depressed alter ego? Listen up. On May 29, Americans watched Puddles Pity Party—the sad clown alter ego of Atlanta entertainer Mike Geier—belt out Sia’s “Chandelier” to the delight of the judges on NBC’s America’s Got Talent. The video of the audition quickly went viral; it currently has more than six million views on YouTube. Before Sia, there was Lorde, and Puddles and frequent collaborators Postmodern Jukebox earned certified viral fame in 2013 with this monster hit, which to date has more than 20 million views on YouTube. 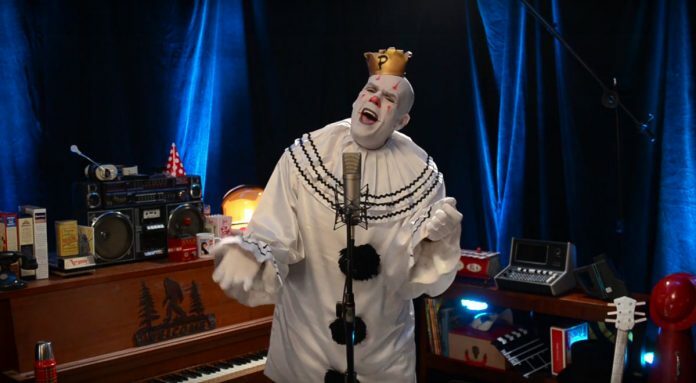 Puddles’ interpretation of the David Bowie classic might give you chills, but it’s all the little quirks in this video that make it great—the hissing of the fog machine, Puddles quietly sucking organic peanut butter out of a packet, the three cups of coffee he downs throughout the four minute epic. This jangly, twangy mash-up of Johnny Cash and The Who is one of Puddles’s most popular songs, with more than a million YouTube views to date. If you’re expecting Green Day’s emo early 2000s hit, this isn’t it. Instead, it’s a jazzy 1933 song by Al Dubin and Harry Warren that shows off Puddles’s belting prowess. If you do want to hear Puddles serenade you with a pop-punk mainstay, however, look no further than this groovy cover of Blink 182’s signature song—another Postmodern Jukebox collaboration. This slowed-down Cheap Trick cover hits you smack dab in the feels. Soaring vocals and a spinning camera will have you feeling dizzy. Puddles might be at his best when he’s covering Bowie, and this charming cover will have you entranced. Finally, if you haven’t seen Puddles’s AGT audition . . . what are you waiting for? The Judge Cuts for this season’s America’s Got Talent begin airing next Tuesday. We’ll be cheering for our favorite local clown to make it through to the next round.